What's happening to carbon that has been stored in the tundra permafrost for thousands of years as the Arctic warms? Is it being rapidly released into the atmosphere in the form of climate-warming greenhouse gasses carbon dioxide (CO2) and methane (CH4) as the permafrost thaws? According to findings from research being done under the Arctic Long-Term ecological Research Project (LTER), which is being funded by the US National Science Foundation (NSF), the short answer to these questions is “Not for the moment”- at least at the site the project studied at Toolik Lake on Alaska's North Slope. A major finding of the study is that as the Arctic warms and permafrost thaws, the huge stores of soil carbon that have developed in the soil over thousands of years (due to cold temperatures limiting the decomposition of organic matter) are not being rapidly released into the atmosphere, as some scientists had predicted. Rather, the carbon has remained in the soil, with some of it being sequestered by new vegetation growth. As a consequence, the carbon balance in the soil at the Toolik Lake research site has remained more or less unchanged over the past 20 years. The study's lead author, Dr. Seeta Sistla from the University of California Irvine, explains the processes that have allowed carbon to remain in thawing permafrost. She also cautions that this balance may not remain in place forever as the Arctic tundra continues to warm. Could you explain what you set out to discover in your research? The Arctic is warming faster than any other biome on Earth. In this sense, the Arctic represents the “canary in the coal mine” for understanding how biomes around the world may respond to climate change. Scientists are particularly interested in understanding how high latitudes are responding to warming because these systems store nearly half of all global soil carbon in permafrost, or permanently frozen soil. This large store of carbon in the permafrost formed because the cold Arctic climate has limited soil decomposition. Decomposition is a fundamental process of energy and nutrient cycling that connects living and dead organisms. Decomposition occurs when dead organic (biological) matter such as plant litter (dead matter that falls off plants during seasonal cycles) is broken down into its component parts by a group of organisms known as decomposers. Decomposers include bacteria, fungi, worms, termites, and other animals. When decomposers consume dead matter, they release some of it as carbon dioxide (CO2) and sometimes methane (CH4). Decomposition also releases back into the soil nutrients such as nitrogen and phosphorous that are essential for plant growth in forms that plants can easily take up. As the system warms, decomposition accelerates. Increased decomposition and the subsequent release of nutrients is one of the main factors that increases plant growth in the Arctic. In the Arctic, plant growth is constrained not only by climate, but also by the amount of nutrients in the soil. Because decomposition is a very slow process in tundra ecosystems, the release of nutrients from the soil is also very slow. If you accelerate decomposition, you accelerate the release of carbon dioxide. But you also accelerate the release of nutrients that plants use to grow. What kind of feedbacks were you able to identify in the system? Feedbacks between a changing climate and ecosystem processes are important to understand, because the natural movements - or fluxes - of carbon coming in and moving out of terrestrial systems every year are more than 10 times larger than the carbon released into the atmosphere from human activities such as fossil fuel combustion. carbon that is released back into the atmosphere through decomposition as CO2 and other greenhouse gasses. Because these terrestrial carbon fluxes are very large, even a small increase in how fast decomposition takes place in the soil compared to how fast photosynthesis takes place can have significant impacts on atmospheric greenhouse gas concentrations. Therefore, even a slight increase in average temperature could be enough to stimulate the decomposers in tundra permafrost to release large amounts of permafrost carbon into the atmosphere as CO2. These carbon fluxes can be a massive positive feedback, which has implications for ongoing climate change. Is it possible to predict exactly how much carbon emissions could accelerate as the permafrost warms? Predicting how much climate warming will accelerate carbon emissions coming from thawing Arctic permafrost is complicated, since warming also accelerates Arctic plant growth and therefore photosynthesis, a process that removes carbon from the atmosphere. So increased plant growth is a negative feedback compared to warming-driven increases in atmospheric CO2 concentrations. Scientists have noticed that climate warming has already made the Arctic “greener” over the past few decades. We've seen greater growth of shrubs (typically birches and willows) in areas that were previously dominated by much smaller tundra sedges. The fear some scientists have is that some of the carbon that has been stored in the soil for millennia will be lost to the atmosphere faster than additional CO2 released into the atmosphere can be fixed into plant biomass by photosynthesis as warming stimulates increased plant growth. 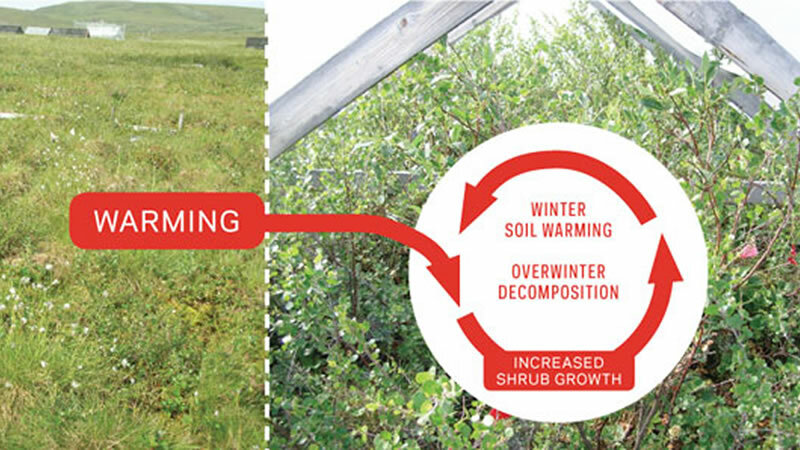 So in our study, we looked to see whether after 20 years of conducting artificial warming experiments on plots of Alaskan tundra permafrost using greenhouses, the resulting increased plant growth has either outpaced or been outpaced by increased soil decomposition. We found that in our warming experiments, the artificially warmed study plots have become greener and shrubbier over the past 20 years. We also saw a large decline in the amount of mosses, and a loss of lichens – a critical overwinter food for caribou. Meanwhile, the amount and size of dwarf birch (Betula nana) has increased. The amount of plant litter falling to the soil has also increased. So overall, we've seen both plant biomass and plant species composition change over the past 20 years as a consequence of the experimental warming. Below ground, we saw no net change in the amount of carbon in the soil. What this means is that whatever carbon was lost due to increased warming has been balanced by carbon inputs to the soil due to increased plant growth and subsequently more plant litter dropping to the soil. Is the tundra ecosystem becoming more like a boreal forest ecosystem as time goes by? The boreal forest ecosystem is a very different ecosystem. There are other constraints involved besides temperature alone. You also have to take into account the amount of light an ecosystem receives. As you move higher and higher in latitude, the growing season becomes shorter and shorter. And you also have to consider moisture constraints. So these tundra ecosystems aren’t turning into boreal forests. But they are becoming greener and woodier. We’re seeing more small trees and shrubs, not tall trees like you see in the boreal forest. With warming, has the active layer of permafrost been getting deeper? One interesting finding is that the maximum thaw depth of the active layer of the permafrost has been getting deeper. It reaches a maximum extent in September before it freezes back up to the surface again during the winter. 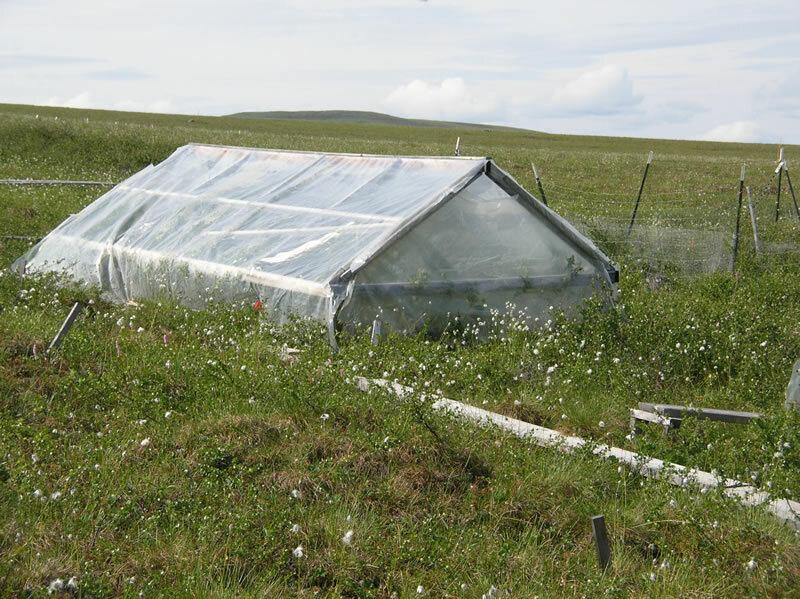 Experimental warming conducted using greenhouses placed at the surface of the permafrost has been increasing the depth that the active layer of permafrost thaws to over the course of the summer. Intriguingly, we found the strongest biological effects of warming in the deepest part of the soil we sampled: the mineral soil horizon (a soil layer that consists of densely packed, fine soil particles), which directly overlies the permafrost. We referred to this as a “biotic awakening.” Warming stimulated mineral soil decomposers and, as a consequence, the deeper soil food web expanded. We also observed a slight increase in the amount of carbon present in the mineral soil overlying the permafrost. This is likely due to a deeper maximum thaw depth, as well as an increase in the amount of plant litter coming from more plant roots growing and dying in the soil. What does this mean for the ecosystem over the long-term? Even though we didn’t see a net change of carbon in the soil over 20 years of warming, the fact that the active layer is becoming deeper and the mineral soil decomposers are becoming more active suggests that carbon from new plant growth and plant litter - as well as potentially older carbon that has been stored in the soil for millennia - is becoming active as decomposing microorganisms make use of it. Does this mean that the ecosystem can handle the excess carbon becoming available as the permafrost thaws, keeping it from entering the atmosphere in large amounts? So far, it's unclear whether the effects we’ve observed over the last 20 years of experimental warming - where there’s been no net loss of carbon from the soil with sustained ecosystem warming - will continue. We don’t know yet whether or not the situation we’ve observed is only a transition state. After a certain point, we may ultimately see a net loss of carbon from the soils into the atmosphere. This remains a major uncertainty. But the fact that we've determined that the active layer of the permafrost has become deeper and the decomposers have become more active over the past 20 years is already a critical finding. The amount of carbon per unit volume of soil tends to increase in the deeper parts of the active layer of permafrost. Activating that soil carbon as the permafrost thaws may eventually lead to a major release of carbon into the atmosphere. Do the findings give you clues to where a tipping point might lie? It remains challenging to predict future climate conditions - including when ecosystems might lose their current resilience to warming - in large part because of the complexity of ecosystem feedbacks in the face of ongoing climate change. For example, we observed the development of a winter warming effect in the soil over time. The winter warming effect is actually stronger than the summer warming effect. What appears to be happening is that as the vegetation becomes shrubbier in the greenhouse plots, they catch more snow than the less shrubby tundra normally would. 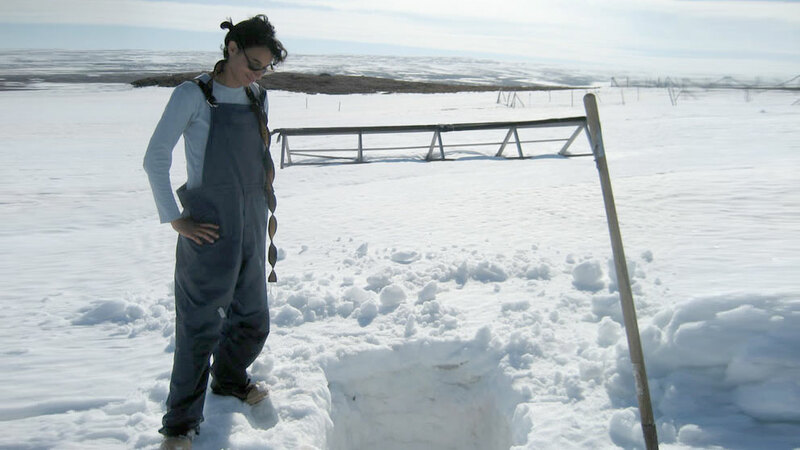 This snow cover insulates the soil over the winter, which increases the winter soil temperature. So there’s a feedback between the plant structure and the soil temperature, which further promotes decomposition (and therefore also plant growth). We don’t yet know whether the resilience of tundra soil carbon stocks to long-term warming will be sustained, or whether we're witnessing a transient phase that will eventually give way to accelerated carbon release as the indirect feedback of winter soil warming continues to develop. Several other studies suggest that winter warming of permafrost more strongly stimulates decomposition than summer warming. Our study highlights the sensitivity of the deeper soil carbon to surface warming, and the importance that ecological feedbacks can have on ecosystem carbon budgets. This is critical to understand, because the part of the soil where the mineral soil transitions to permafrost contains the greatest proportion of the actively cycling tundra soil carbon. An increase in decomposer activity in that deeper soil could have significant ramifications for future CO2 release from tundra systems. The development of winter soil warming will likely increase decomposition to a degree that outpaces increased plant growth over the next couple of decades. This would lead to a net loss of carbon from the soil to the atmosphere. New studies will include more detailed investigations of the how warming alters the mineral soil, which may yield clues as to how the carbon cycle is changing that deep in the soil. Does the extra growth in shrubbery also cool the soil during the summer? Another feedback to the changing plant communities is that as the plants grow bigger, they essentially shade the soil from the sun. Energy input from the sun’s rays is the primary way permafrost gets warmed during the summer. If you have more shrubs, they increase shading of the soil. We saw the summer warming effect in the experimental greenhouse plots decline over the study period as the tundra became shrubbier. Over the same period we saw the winter warming effect develop. However there are a lot of feedbacks involved. It’s a complicated system to study because each element in the system that changes creates a cascading effect of interacting changes. We've only been able to capture a snapshot of how certain elements in the system have changed and how they're interacting. I’m sure we missed some feedbacks in the system. You can only measure so many things at a time in these kinds of experiments. We had to pick and choose what to look at. Could a massive increase in plant growth theoretically take in all the carbon that might potentially become released from the soil? That’s the major uncertainty in this ecosystem. At this point in time, it appears that plant uptake of carbon through photosynthesis and growth has outpaced the loss of stored carbon from the soil. As of yet, there is no net change in carbon in the active layer from experimental warming. But whether this will continue to be a steady state or whether decomposition of soil carbon in the deeper soils as the permafrost thaws will outpace plant growth is not something we know right now. Some of the work form other studies suggests that winter warming has a much stronger effect on decomposition than summer warming, and stimulates a net release of CO2 from Arctic ecosystems. Because the summer warming experiment has promoted winter warming by increasing snow-trapping shrubs, it could drive the whole ecosystem to become a net loser of carbon. This is what the winter warming experiments are pointing to. Our experiment was unusual in that it was intended to be a summer warming experiment only, but it turned into a summer and winter warming experiment in the end. Researchers who have done winter warming experiments see that there is much stronger decomposition going on during winter compared to summer. The reason for this is that when the soils are just below freezing, even relatively small increases in temperature strongly stimulates decomposers into action. Seeta Sistla from the University of California Irvine is an ecosystem ecologist who studies how soils, plants, and microbial communities respond to environmental change, and how these changes can feedback to affect larger-scale ecosystem processes. Her research combines biogeochemistry, microbial ecology, mechanistic modeling, and field studies. View of a plot of tundra studied under the Toolik Lake research project.